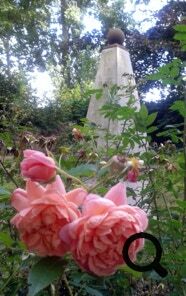 In founding Emma Hamilton Society and as Emma’s direct descendant, I decided to actively encounter sites where she had been to seek traces of her presence. We visited Ness in April 2017. As members will be aware, it is a small village near Neston in Cheshire which expanded during the industrial revolution because of its half submerged coal mines. Our guide here was Dr Geoff Wright (now Emma Hamilton Society’s Historian) who explained that the precise location of the house in which Emma was born is debated, but a plaque and anvil memorial – Emma’s father, Henry Lyon had been the mine’s blacksmith – marks the approximate spot. Both plaque and memorial were erected by The 1805 Club in conjunction with Burton and Neston History Society and Neston Town Council in 2015. Geoff took us to walk along the historic shoreline of the now silted – though still wide – Dee to the location of the once busy mines, but little trace remains of the rural industrial sprawl of her infancy amidst the new, affluent suburbia. However, St Mary&apos;s and St Helen&apos;s Church in nearby (and industrial revolution unspoilt) Neston still holds the original font in which she was baptised on 12th May 1765: a very tangible connection. It felt very good to me that Emma is remembered and celebrated here. We had visited Hawarden en route to meeting Geoff in Neston. It is picturesque village of in north eastern Flintshire, close to the Welsh border with Cheshire. A single picture of Emma’s ramshackle childhood thatched cottage depicts it next to the Fox And Grapes pub: an inn still in business since her childhood. 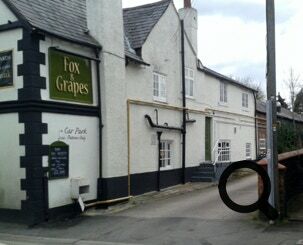 Somewhat disappointingly, the site of her cottage is now occupied by tarmacked access to the pub’s carpark. Being so close to the pub, it was easy to imagine young Emma excited to join the noisy revelries. There were a few portraits of her inside the pub and a print of the now demolished cottage, but the current landlord was completely unaware of her connection to the village and there is no information plaque inside or out, instead the road is dominated by an elaborate memorial to Prime Minister Gladstone (who married into the local, landed Glynne family). Although some Emma biographies may give the impression that her Hawarden home was far from her birthplace in Ness, the distance in fact was just eleven miles over flat country via Lower Ferry (renamed Queensferry in 1837 to commemorate Victoria’s coronation). Geoff also took us to visit the resort of Parkgate, which stands a mile or so westwards from Ness and Neston. Here teenaged Emma holidayed with her infant first born, “Little Emma”. It has been proposed that Emma maintained no connection with her birthplace, but visiting Parkgate and Hawarden suggests through their proximity that her connection had stayed very much alive. Visiting Naples in April 2017 – the cradle of her Attitudes, uber stardom and intimate friendship with Queen Maria Carolina – revealed no obvious traces of Emma beyond the prevailing view of Vesuvius across the Bay, which features in many of her portraits. This view alone conjured her spirit to me more strongly than just about anywhere else I’ve so far visited, but it was sorely disappointing to discover all access to Palazzo Sessa, Sir William Hamilton’s Ambassadorial residence and Emma’s main home there, in which she met Nelson, is partly occupied by a Synagogue and strictly out of bounds to visitors. 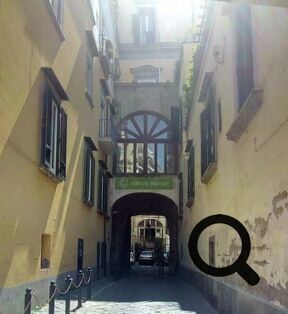 The Palazzo is accessed through a narrow, paved lane ending in a short tunnel where it pierces a building. Two armed Italian Army soldiers were posted at this spot. They seemed amicable enough, but a man from the Synagogue quickly rushed out and told us to leave at once. Although the soldiers confirmed that this was Palazzo Sessa and seemed genuinely interested in my clumsy attempts to explain via skant shared language that Emma is my direct ancestor, the Synagogue member, now joined by a grim-faced old lady, was adamant that we could enter no further nor take a photo: just go! I took the opportunity to scan the courtyard beyond and gained the impression of tall, sunlit facades and deep, planted balconies. I could imagine young, confident and beloved Emma twirling vivaciously up this covered lane into the Palazzo. I was greatly saddened to be shooed away – it felt a crime against cultural heritage – although I respected that the Synagogue members perhaps felt threatened. I was very glad, however, to have snapped a photo (in which you can see the soldiers) on our approach to Sessa. 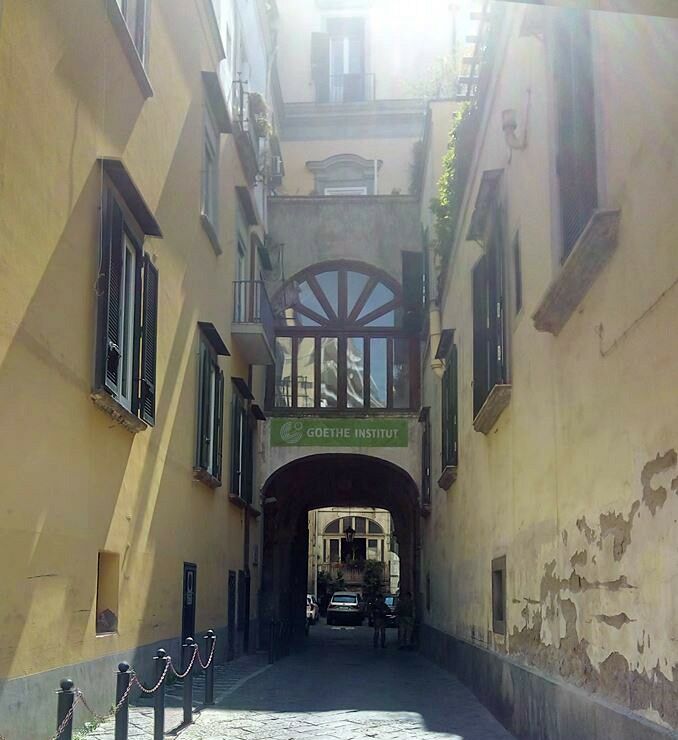 On leaving, we passed a large book and music store, la Feltrinelli Librerie, on the corner of via Santa Caterina a Chiaia where I bought a tambourine as a memento of Emma’s happy time here. Along the bay is Sir William’s former summer house and private beach where Emma once bathed. Sea bathing was very fashionable at this time and Emma was personally very keen to use it as a cure for eczema. Their beach became one of Italy’s first beach club resorts: Bagno Elena. 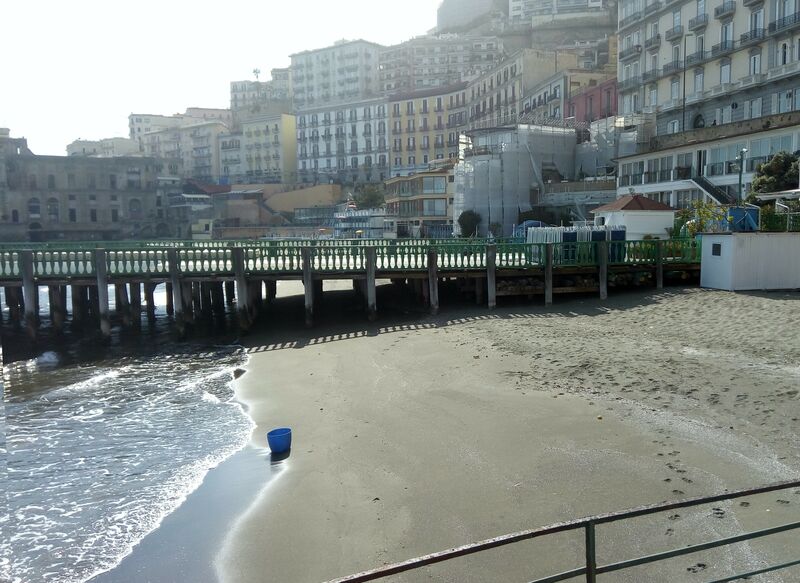 Their website does reference Emma, but with little historical accuracy: The history of Bagno Elena begins in 1840, on a strip of sand already discovered in the ‘700 by Admiral Nelson who made it a refuge for his love affair with Lady Hamilton. Bagno Elena has attracted many celebrities in its time, such as Oscar Wilde & Richard Wagner. Sir William’s little summer house (unfortunately covered in scaffolding when we visited) juts out over the beach. 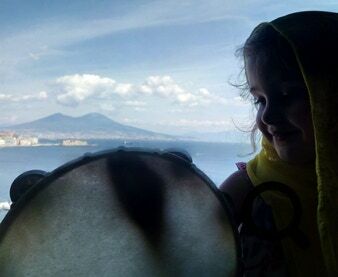 It was celebrated in their day for having the best Vesuvius view in town. Bagno Elena, unfortunately, was closed when we visited, but is open to the public during the tourist season for a small fee. We viewed the golden sand from an adjacent seafront bar instead and asked the staff if they knew what was being done to the scaffolded beach house. They shrugged their shoulders, these things can take a long time they said, who knows! I’ve heard tell that the local Mafia extort such high cuts from project funds that progress moves at snail pace if at all. We visited Great Yarmouth, Norfolk in July 2017 where we were shown two Emma sites by local historians, Bertie and Debora. 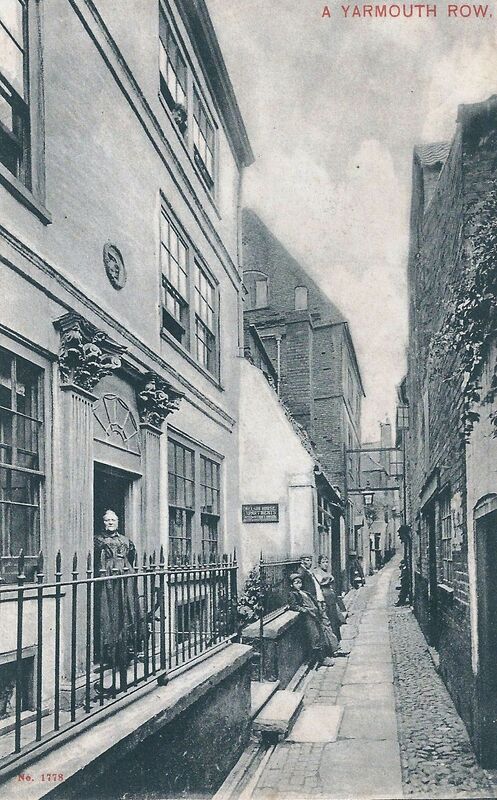 Our first call was to the inn, now a chartered accountants but then called The Wrestlers’ Arms, where Emma (heavily pregnant), Nelson and Sir William stayed on first landing in Britain in November 1800 after their return from Naples. Emma and Nelson had stood on the inn’s balcony facing a huge crowd cheering Nelson’s Nile victory. The accountancy firm have kept interior friezes depicting Nelson being pulled in his carriage to the Wrestlers’ by adoring locals in place of horses after his triumphal landing. Debora said she well remembered going there when it was still a spit and sawdust pub. The second Yarmouth Emma site Bertie and Debora showed us was the a building in Row 57 (“rows” being a network of narrow lanes) that had historically served as a guest house. 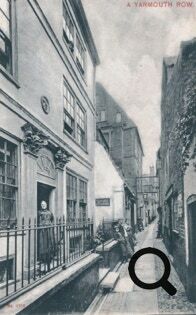 It is believed that Emma stayed here, distraught and very heavily pregnant when Nelson left for Copenhagen on January 17th 1801. Emma, who was carrying twins, had done her best to conceal her illegitimate pregnancy and Gillray delighted in caricaturing her as a monstrously fat “Dido in distress” weeping dramatically as Nelson sailed away. 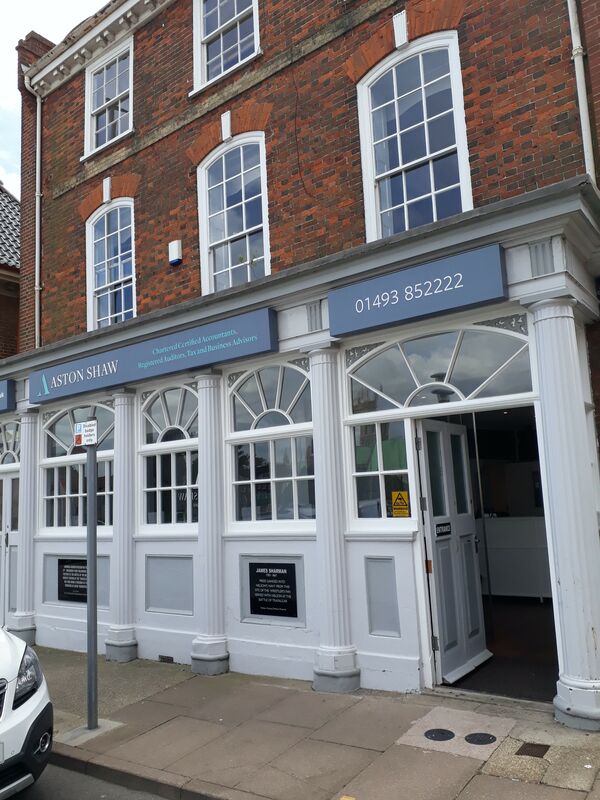 I wanted to visit the place where Emma, Nelson and Sir William landed and our guides directed us to Gorlestone across the River Yare where there is a plaque on The Pier Hotel. Disappointingly, but – sadly – unsurprisingly, only Nelson is named on the plaque, which states: he landed at Gorlestone on 6th November 1800 on his return from Europe – Admiral Horatio Nelson – Following his victory over the French fleet at the Battle of the Nile 1798. 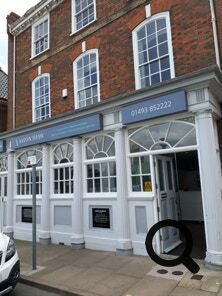 The plaque is fixed to the rear wall of the Pier Hotel facing back across the Yare towards Yarmouth and it was unclear exactly where they landed. Was it on the banks of the Yare? 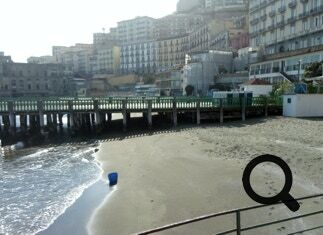 Or on the pier that juts out from the hotel or on the beach to the south? Asking in the pub returned the consensus that it was on the beach, but what records I have found are conflicting. 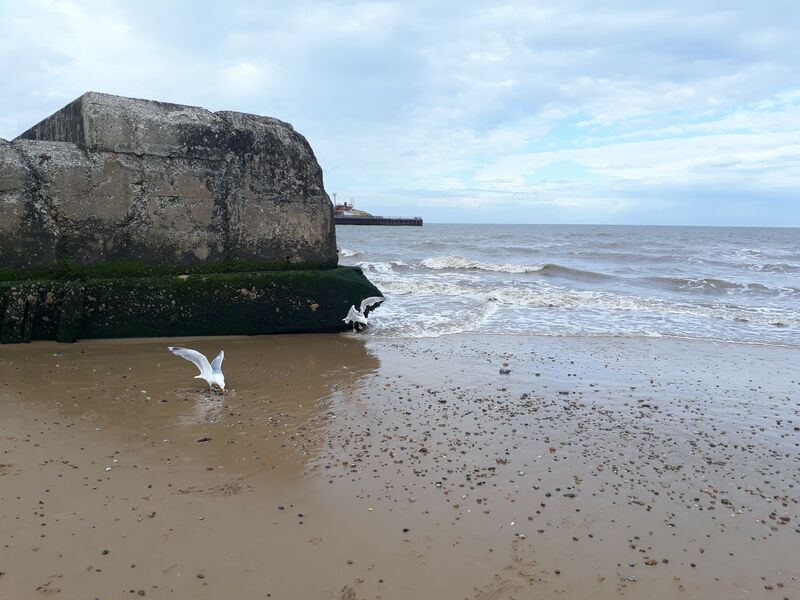 Les Cole, from the Great Yarmouth Local History and Archaeological Society, as reported in Great Yarmouth Mercury, 9th June 2015, stated, “Nelson rowed ashore onto Gorleston beach. He claimed it was bad weather – whether that was true or he wanted to avoid the dignitaries we don’t know.” Whereas, Norfolk Record Office Archive Education and Outreach Service state in a PDF, “Emma travelled back to England with him: they landed at the South Quay in Gorleston in 1800.” However, regardless of whether they landed on pier or beach, the verdict appears unanimous that it happened in Gorlestone, which was at this time in Suffolk. sixty metres (200 feet) to the south east was ‘Merton Place’ the only house ever owned (1801-1805) by Admiral Lord Nelson and from which he set out for the Battle of Trafalgar. Lady Hamilton also lived here (1801-1808). Our guides that day were knowledgeable local couple, Mike and Lesley. 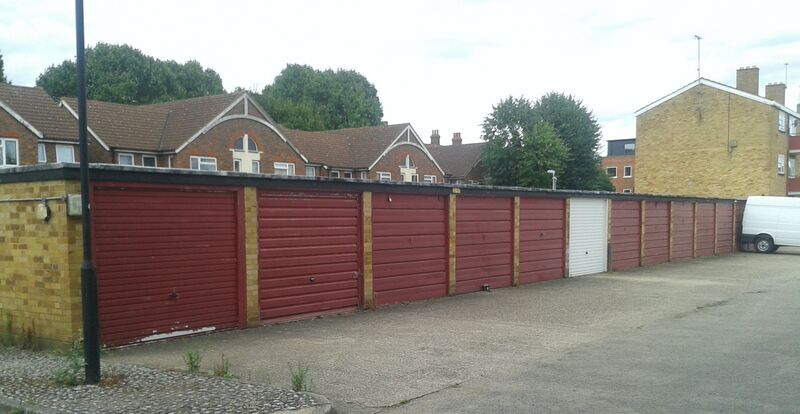 After viewing the bleak lock up garages that stand on the site of Merton Place, they led us through a tranquil, unmodernised area of Merton to St Mary the Virgin. Emma and Nelson worshiped in this beautiful, ancient church and an original pew from their time there has been preserved. It as at the front next to the altar. 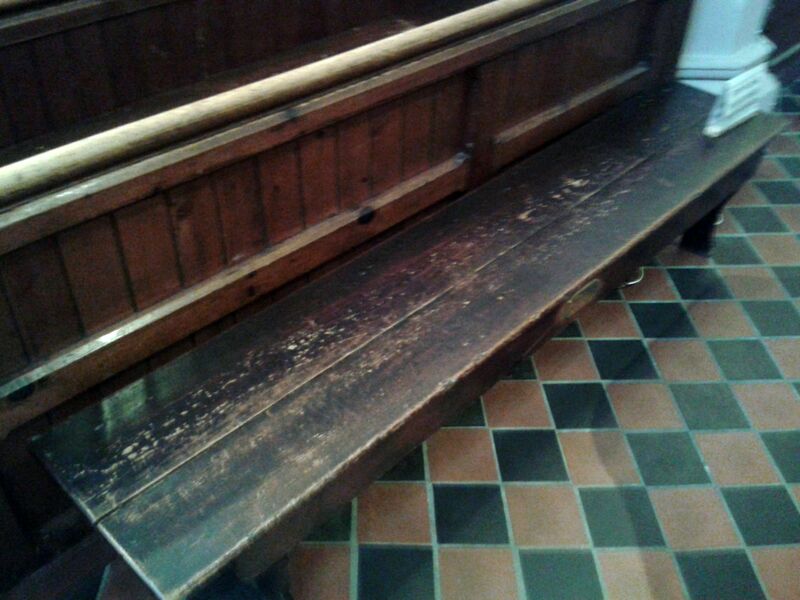 This pew is normally alarmed, but the church warden kindly permitted myself and daughter, Sophie to sit on it. This single, wooden relic felt to me to be by far the strongest surviving connection to Emma and her happy time with her beloved. When the warden pointed out the altar just in front of this and related that it was where she and Nelson exchanged their vows of marriage ‘of the heart’ before he left for Trafalgar, I felt an electric shiver run through me and my hairs stood on end. The warden said she felt this too. To feel not just Emma, but Nelson as well so close and so real was deeply moving and quite wonderful – as well as poignant. Visiting St Mary’s was spiritually soothing after the desolated site of Merton Place. 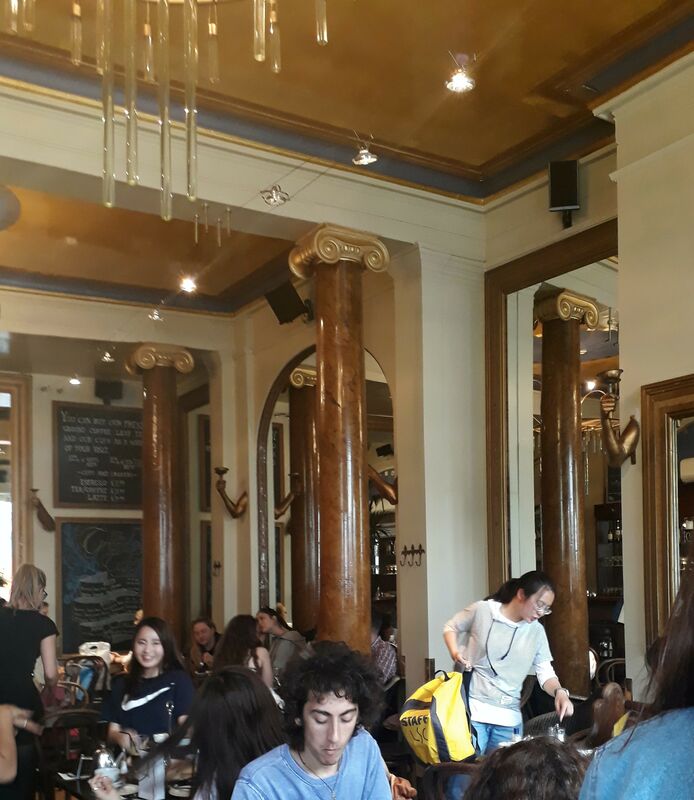 I’d been keen to call into The Grand Café on Oxford High Street for high tea as this aptly named cafe, replete with gilded columns and full-wall mirrors, was once part of the coffee rooms of The Angel Inn where Emma, Nelson and Sir William dined with my other 4th great-grandparents, George and Kitty Matcham on 21st July 1802 at the start of their Grand Tour of England and Wales. The decor has surely changed, but Emma would have felt most at home amidst this current neoclassical splendour. It would have been a very happy time for her. She and Nelson, at the peak of fame, had everything to look forward to (including weeks of holiday time together) and the Matchams were her good friends. They later became her staunchest allies, there for her until her bitter end. Visited on Nile Day 2016, the Nile Clumps (adjacent to Stonehenge) proved to be an unexpected living artifact of Emma and her enduring love for Nelson. The clumps comprise a series of beech tree plantings across a swathe of farmland, remembered locally as having been planted by ‘Old Q’ (Baron Douglas of Amesbury), at the behest of Emma and Captain Hardy to commemorate Nelson&apos;s Nile victory. Each clump represents a ship of the British and French fleets. Restoration of the clumps, which needed replanting after two hundred years, was commenced by Rotary Club of Amesbury in 1990. The 1805 Club provided the money for the Vanguard Clump to be replanted. 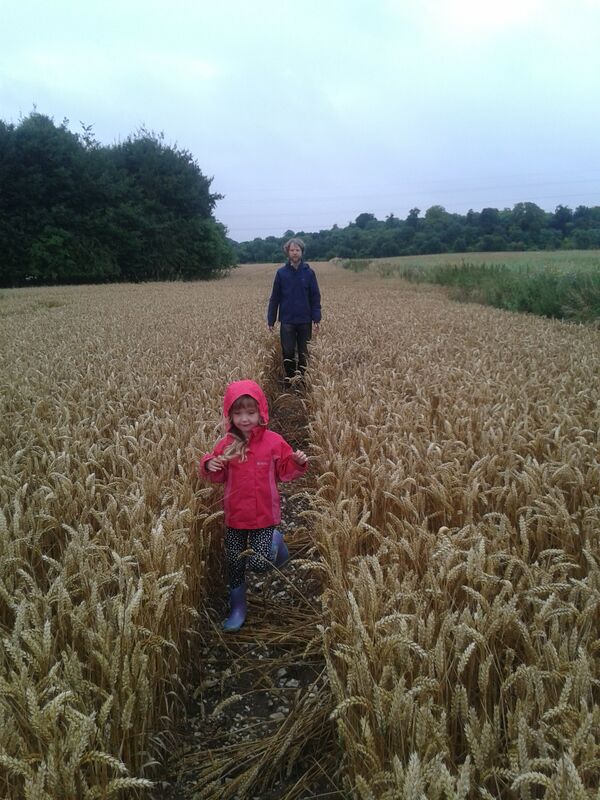 Our guide, Graham of the now amalgamated Salisbury Rotary Club, took us on tour by car and foot through wheat fields. The scale of the Clumps was stunning and easier to grasp looking at an aerial photo he gave me. It feels remarkable that Emma’s living memorial to Nelson survives. The design of this unusual living monument feels very ‘Emma’ (after all, she innovated an entirely new artform with her Attitudes). The Rotary Club are funding replanting via tree sponsorship – perhaps unsurprisingly, few French clumps have attracted sponsors. We have sponsored a Goliath Clump tree for our daughter, Sophie. Visiting Calais after Merton in early August 2016 was by far the saddest point in retracing her steps. We traveled there by ferry from Dover and I bore her keenly in mind as our boat drew us across the channel. For forty-nine-year-old Emma, desperate, ill and hounded by debt collectors, this was her last voyage. She had forsaken England and her hopes of Nelson’s dying wish that she and Horatia be granted state pensions, seeking instead refuge and respite – like the thousands of contemporary refugees who have thronging to this same town. The house in which Emma died on 15th January 1815 (just a few months after her arrival) has, as with Merton Place, vanished under new build, but is marked by a plaque on Nord-Pas de Calais, close to the place of her death on the former Rue Francaise. Sadly, even her grave was lost to nineteenth century urban redevelopment and World War II bombs, but a Vice President of The 1805 Club, Jean Hart Kislak, established a memorial close to the site in Parc Richlieu. The park revealed itself as a green oasis within Calais’s industrial sprawl. Emma’s discrete obelisk stands on a low, weeping willow shaded hill overlooking a pond with a gently tinkling fountain. What looks like an Emma Hamilton shrub rose has been planted beside it. The setting felt soothing and beautiful. As I stood before her memorial, reflecting on her bitter decline after such a glorious rise, an older lady and little boy approached chattering happily as they ambled across the pond’s bridge. 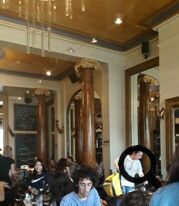 My first instinct was to wish them gone so I could contemplate in peace, but they didn’t go and, although my grasp of French (like Italian) is poor, I understood the lady’s words, ‘Grande dame’ (great lady) and decided to talk to her. Her English was better than my French and she relayed to me that she liked the memorial, but wasn’t quite sure who Emma Hamilton was (the inscriptions are in English only). She was with her grandson during a rare day off, normally she was busy working voluntarily to help the refugees. This crisis had been going on for years she said, since long before the media took any interest, and she and her husband had been the first people to help them; the first to provide them with electricity. Today, she said, was a victory because they’d succeeded in providing a big TV for the refugee children to watch cartoons on. And what a Grande dame she is too, I thought. How apt for me to meet her here. Emma gained her Maltese Cross for aiding the starving population of Malta during the English blockade of the occupying French. Emma, no matter how poor, was always generous to the needy. I felt truly honoured to meet this most generous and compassionate Grande dame here by Emma’s memorial.